Wearable technology has mushroomed over the past few years as adoption rates have climbed. In fact, even back in 2014, 20% of US adults said they already owned a wearable device according to PwC research. Wearable device technology includes all things smart such as: activity trackers, wearable cameras, glasses, watches, sports accessories, rings, clothing, gesture control armbands, augmented reality ski goggles, necklaces, bracelets, earrings, bras, digital tattoos, hair clips, shoes and even underwear. These bastions of the Internet of things allow embedded sensors to know you, communicate with other sensors, track what you are doing, improve health and generally enhance your life (at least that is how they are billed). Look around you these days and you will notice everyone is staring at a small screen and reading or doing something. This is the transition stop until we see the inevitable move toward full wearable technology in the next 5Ys or so. Should banks stay on the side and watch the wearable trend from afar? No way! We say this because the emerging wearable technology that we spot nowadays in Google Glass, the Apple Watch, fitness trackers or Jawbone's UP is a mighty good way to detect the interest of millennials, those new and promising customers that banks want so badly to attract. In fact, a British survey by Intelligent Environments found that the millennial generation loves wearable banking technology. The survey found 46% of 18 to 30 year olds say that they already adopted it on a smartwatch or some other wearable device. 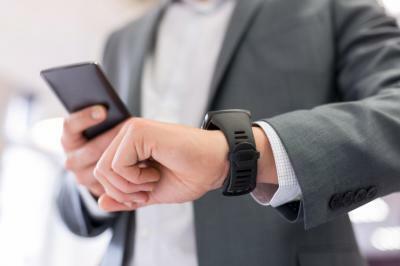 Right now customers who are really familiar with wearables are early adopters, fitness enthusiasts, and technology evangelists, but they will soon be joined by the average Joe if that trend follows what happened with online banking or mobile apps. According to Accenture, 41% of Americans already plan to buy a smartwatch in the next 5Ys. This is good news for banks because smartwatch aficionados also have more financial products than the regular non-connected customers. It seems the convenient personalized services associated with wearables incite them to bank more. They are said to be loyal, engaged and profitable. Over time, regular customers will eventually pay with their glasses or check their account on their smartwatch and they will expect a seamless experience. Banks that are experimenting with wearables intend to be ahead of the curve. They plan to do research, enhance their apps, refine them and offer a high level of security when the time comes. Of note, interesting experiments are being conducted all over the world. Banco Sabadell in Spain worked on a prototype for Google Glass, Westpac in New Zealand had its own test, and Tangerine in Canada and PrivatBank in Ukraine followed the same path. DAB Bank in Germany has been playing around with Apple Watch apps. Westpac allows interested customers to check balances without logging into their accounts. The bank is also working on transfers and alerts. Wells Fargo allows customers to view their accounts, check recent transactions and monitor cash flow. As if that weren't enough, Fidelity Labs concentrates its efforts on the stock exchange; the Fidelity Market Monitor has daily market quotes for Google Glass owners; Jawbone UP4 pays your small expenses; and a tap of the wrist activates your American Express card. More complex apps are in the pipeline for the future, so we will certainly see remote check deposits for wearables, specific alerts when the customer reaches a low balance, or security warnings. We could very soon even transfer funds or purchase equities when the stock price hits a preset level. Finally, why not use the biometrics of our fitness trackers for authentication? It sure beats trying to remember all of those passwords. Wearables are here, so it might make sense to start playing with them to better understand opportunity and limitations. There was little movement in bonds as yields fell 1bp while oil prices hit a two-week low. 1) Bank of the Sierra ($1.7B, CA) will acquire Coast National Bank ($145mm, CA) for about $13.8mm in cash and stock. 2) BOKF ($30.4B, OK) will acquire investment advisor Weaver Wealth Management (TX) for an undisclosed sum. BOKF picks up a reported $340mm in assets under management with the transaction. Western Nebraska Bank ($82mm, NE) has acquired the Paxton, NE branch of Pony Express Community Bank ($86mm, MO) for an undisclosed sum. The KBW Nasdaq Bank Index shows performance of bank stocks over the past 3Ys has declined from +35% in 2013 to +7% in 2014 and then dipping to -1.6% for 2015. Let's hope things rebound in 2016. Softer year-end manufacturing and construction spending has led JPMorgan to cut its Q4 GDP forecast from 2.0% to 1.0%. Meanwhile, Fed Atlanta economists now predict Q4 GDP will be 0.7% vs. 1.3% prior. The Wall Street Journal reports employers added 15.3mm square feet of office space in Q4, the highest quarter since Q3 2007. This helped push the vacancy rate down to 16.3%. JPMorgan has agreed to pay $307mm to settle SEC and CFTC charges that it pushed clients in its wealth management business to invest in its own proprietary products from 2008 to 2013. Bloomberg reports JPMorgan will pay $48mm to the OCC to settle mishandling of foreclosures through robo-signing during the credit crisis. Gold prices have tanked 45% since 2011.